The Hourglass Effect – My Labor of Love is Being Released! About five weeks ago I was on the phone with Jason Jones and found myself casually volunteering for what became an all-consuming task and a true labor of love. For those of you who don’t know Jason, he’s the co-Founder and CEO of the LendIt Conference and one of the most connected people in the “next-gen lending” space. We talk from time to time and I’ve always done my best to answer his questions knowing that whatever questions he asks is likely being asked by others as well. So when Jason asked me “why haven’t the Banks re-entered the personal loans space” I started to answer him but stopped quickly. I knew the answer but articulating it was going to be a very involved exercise. So I did what I always do — got myself in over my head by volunteering to write a whitepaper and present it at LendIt. Five weeks later and many hours of burning the candle at both ends: here it is. 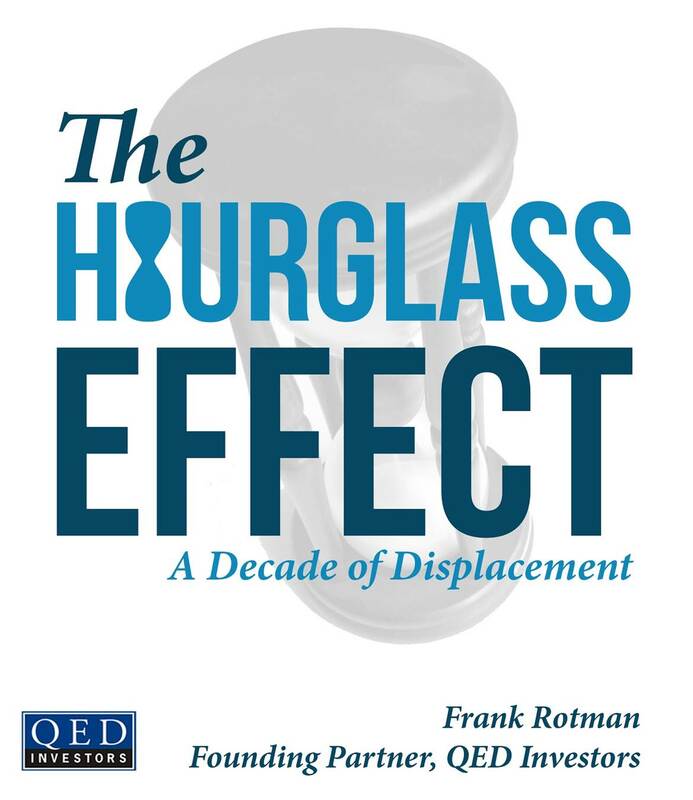 The Hourglass Effect – A Decade of Displacement. If you’re at LendIt come attend my presentation and say hello. If not, download the paper below and enjoy! I enjoyed how Frank wove his personal narrative to provide an entertaining and insightful look into how structural shifts in economic and regulatory forces in the banking industry over the past decade gave rise to a new ecosystem of fintech companies. I really like his analogy of a tipping hourglass to portray how fintech companies are starting to target the mispriced (i.e. under-utilized/latent) capital liabilities and assets formerly held captive by the incumbent financial firms. I especially agree with his conclusion that there is a strong chance of “Scenario #4: Knife Fight” developing as although marketplace lending started out as a blue ocean, it is quickly becoming a red ocean as new fintech startups and incumbents are attracted to the accelerated valuation creation opportunity provided by the asset-light nature and high operating leverage of this new type of business model. I’d say the knife fight is well underway — and has been for at least 3 quarters. But perhaps not all of the participants were aware. Frank, excellent paper and blog (just saw this on LinkedIn). I think there is one more scenario that the non-traditional players need to be thinking about, and that is the “Crony Capitalism” response by the traditional lenders. The major banks have lobbying budgets and strong relationships with the regulators (just look at the number of ex-Cap One folks who made the jump to the regulatory sphere, for example). I think once the non-traditional players become a significant threat, the big banks will influence the game by getting the Regulators to do their bidding for them. In most industries with heavy regulation, the regulators become co-opted by the regulated and then turn into a vehicle to restrain trade, reduce competition, and build profits. It won’t be long before the banks cry “foul” and demand new constraints be put on the likes of Prosper and others in the interest of “consumer protection”, “banking system stability”, or “investor protection”. As it is, regulators struggle with new-age internet businesses — just look how Uber upset the apple cart and how the regulated are demanding that Uber play by their rules. Banking is no different.